It is a known fact that thyroid malignancies are the most common of endocrine malignancies. Furthermore, differentiated thyroid malignancies including the papillary and follicular types are the most common among these malignancies of the thyroid. However, it is extremely uncommon to get a combination of two primary malignancies within the same thyroid gland. These combinations can be classified into collision tumors, mixed tumors, and composite tumors. Whenever such tumors have been described, they have almost always been combinations of papillary carcinoma and medullary carcinoma. Recently, a couple of cases of combinations of papillary and follicular carcinomas are being reported. It is difficult to completely explain the occurrence of such tumor types together in the same gland. Various theories have been proposed to explain this simultaneous occurrence such as the stem cell theory, collision theory, and the hostage theory. It is now accepted that these tumors should be considered more aggressive and having a higher risk of recurrence as compared to either of the tumors occurring independently. Treatment should be patient specific and is directed by the more aggressive of the tumors; however, no standardized protocols for diagnosis or treatment have evolved due to lack of significant information on their behavior. Background: Papillary thyroid carcinoma (PTC) is the most common thyroid malignancy, this study was conducted to evaluate the epidemiological pattern of the disease and also to observe and analyze the peak age of occurrence of PTC. In this article, the importance of preoperative ultrasonography (USG) in evaluating thyroid lesions especially malignant lesions and also its usefulness in correlation with fine-needle aspiration cytology (FNAC) findings in PTC has been studied. 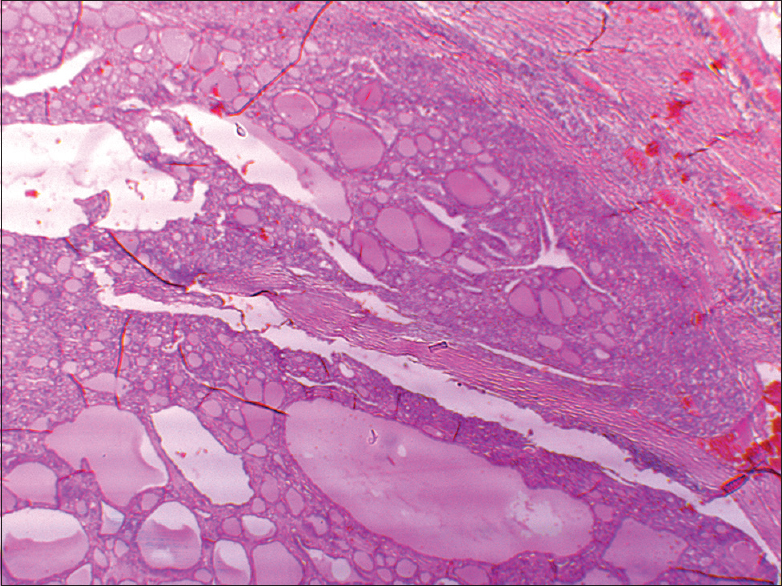 Materials and Methods: It was an Observational retrospective and prospective included 50 patients (>18 yrs) having histopathology proven papillary thyroid carcinoma. All these patients epidemiological parameters such as clinical presentation and management was studied. Data collection from Medical records office department in retrospective cases and analysed using SPSS software system Results: Maximum occurrences the disease were in the age group being after 31 to 40 years (P = -0.0002). Mean age group was 36 years. Malignancy was significantly associated with female gender >86% of patients (P = -0.0001). Various USG features such as echogenicty, nodularity, microcalcification, resistivity index, height and width of tumour correlation was statistically significant with malignant potential. Conclusion: Preoperative ultrasound and USG guided FNAC helped for early diagnosis and timely management. USG guided FNAC decreased the incidence of false negative and non diagnostic results. Pre op usg allows for the early detection of non palpable cervical lymph node metastasis, thereby potentially helps for overall surgical approach in these patients. Cold nodules on Tc 99 thyroid scan suggests malignancy. In future further developments in ultrasound and fnac may further improve diagnostic accuracy of PTC. Background: Gestational thyroid dysfunction has been associated with a variety of adverse pregnancy outcomes. This study aimed to determine trimester-specific reference intervals of thyroid function tests for normal pregnant Egyptian women. Subjects and Methods: A cross-sectional study was conducted at the Obstetric Clinic, Ain Shams University Hospitals. The total enrolled pregnant women were 360, who were divided into the following three groups according to gestational age: Group 1 included 120 participants in the first trimester; Group 2 included 120 participants in the second trimester; and Group 3 included 120 participants in the third trimester. All women were healthy with uncomplicated single intrauterine gestations. A detailed obstetric history, clinical examination, estimation of thyroid-stimulating hormone (TSH), free tetraiodothyronine (FT4), free triiodothyronine (FT3), antithyroid peroxidase antibodies, and thyroglobulin antibodies were done for all participated women. Results: TSH value increased with advancing pregnancy from 1.43 ± 1.16 μIU/mL in the first trimester to 1.78 ± 1.19 μIU/mL in the third trimester, and the difference between each trimester was statistically significant. The FT4 level decreased from 1.16 ± 0.23 ng/dL in the first trimester to 0.98 ± 0.17 ng/dL in the third trimester, and the difference was statistically significant. 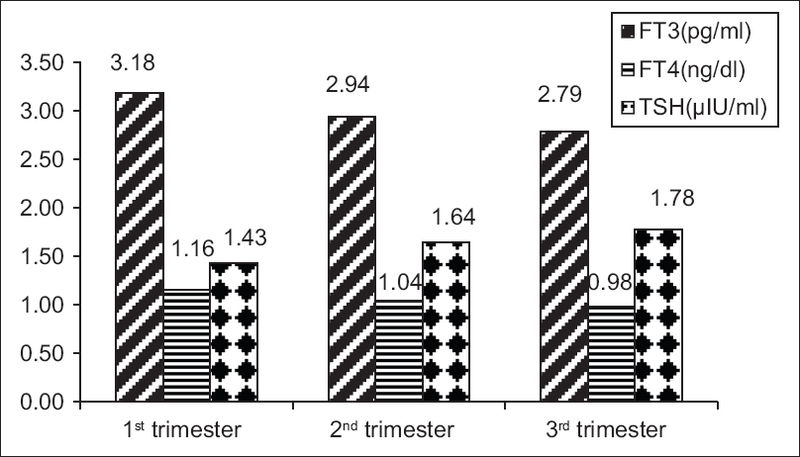 The FT3 level decreased from 3.18 ± 0.52 pg/ml in the first trimester to 2.79 ± 0.38 pg/ml in the third trimester, and the difference was statistically significant. Conclusion: There were significant changes of thyroid function test during each trimester of pregnancy, the reference ranges in this study are different from previous studies outside Egypt. Accordingly, it is necessary to use trimester specific reference range for every population. Background: Iodine excess may trigger thyroid autoimmunity. The aim of this study was to observe the iodine nutrition status in thyroid autoantibody-positive and -negative subclinical hypothyroid (SCH) patients. Materials and Methods: This cross-sectional study enrolled 99 SCH patients (50 thyroid autoantibody-positive and 49 autoantibody-negative) aging 18–65 years from June 2014 to April 2015. Serum free thyroxine (FT4), thyroid stimulating hormone (TSH), anti-thyroid peroxidase (TPO), and anti-thyroglobulin (TG) antibodies were measured; the urinary iodine concentration (UIC) was estimated and the iodine nutrition status was categorized (deficiency, optimal, more than optimal, and excessive) according to urinary iodine levels by WHO/UNICEF/ICCIDD recommended cutoffs. Statistical analysis was performed by using IBM SPSS Statistics for Windows, version 23.0 software. P ≤≤0.05 was considered to be statistically significant. Results: The antibody-positive SCH subjects had a higher mean (299.03 ± 19.43 vs. 263.54 ± 23.10, mean ± standard error of mean, P = 0.314) and median (295.85 vs. 212.70, P = 0.035) UIC than antibody-negative ones. Although there was no statistical difference in the frequency of antibody-positive and antibody-negative status among various subgroups of iodine status (χ2 = 4.941, P = 0.176); the anti-TG titer showed significant statistical difference among the subgroups (P = 0.047) and was the highest in patients having excessive iodine. The frequency of goiter was also higher in patients having over sufficient (more than optimal and excessive) UIC (P = 0.905). UIC did not significantly correlate with serum TSH, FT4 levels, and anti-TPO titer but had a significant positive correlation with anti-TG titer (r = 0.292, P = 0.003). Conclusion: Over sufficient state of UI may be related to the thyroid autoimmunity and goiter in SCH patients. Context: There are little data on the prevalence of thyroid autoimmunity in gestational diabetes mellitus (GDM) and its influence on pregnancy outcomes. 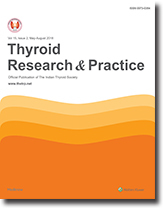 Aims: The aims were to estimate the prevalence of thyroid autoimmunity in euthyroid GDM and to compare the pregnancy outcomes in euthyroid antithyroid peroxidase antibody (TPOAb)-positive women to TPOAb-negative women and to compare the pregnancy outcomes across the euthyroid range of thyroid-stimulating hormone (TSH). Design: This is an observational, prospective cohort study. Subjects and Methods: One hundred women with GDM with euthyroid status were recruited. Samples were analyzed for TSH, free T4, and TPOAb. Women with TPOAb positivity were considered as cases and with TPOAb negativity were controls. Pregnancy outcomes assessed were pregnancy-induced hypertension (PIH), preterm delivery, cesarean section, birth weight, birth asphyxia, neonatal jaundice, hypoglycemia, seizures, and stillbirths. Statistical Analysis: Student t-test and Chi-square test were used to compare the mean values between the groups and differences between proportions, respectively, and P < 0.05 was considered statistically significant. 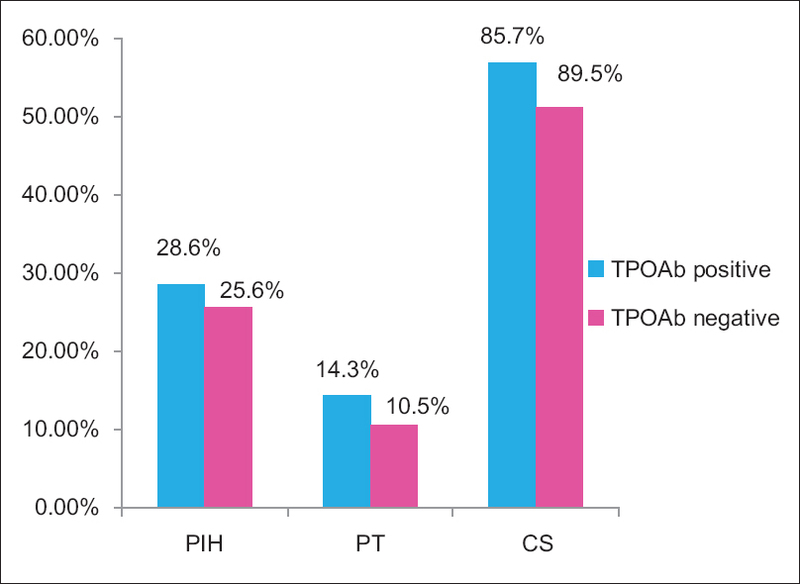 Results: The prevalence of TPOAb positivity in euthyroid GDM was 14%. Pregnancy outcomes between cases and controls were similar except for neonatal jaundice (42.9% vs. 18.5%), which was statistically significant (P = 0.04). PIH occurred in 28.6% and 25.6% in cases and controls, respectively. There was no significant difference in maternal and neonatal outcomes across euthyroid range of TSH. Conclusion: The prevalence of TPOAb positivity in euthyroid GDM was similar to the nondiabetic pregnant women. Neonatal jaundice was more in TPOAb-positive women. Pregnancy outcomes were comparable across the euthyroid range in GDM, suggesting similar range as those without GDM. There is no influence of thyroid autoimmunity on pregnancy outcomes in GDM in the present study. Background: Fine-needle aspiration (FNA) cytology is a keynote modality in diagnosis and screening of thyroid nodules. The management of thyroid nodules largely depends on FNA; thus, it is challenging for the pathologist to distinguish the neoplastic nodule from benign ones and further, categorize the malignant tumors wherever possible. Due to the lack of uniform criteria for specimen adequacy and terminology, “The Bethesda System for Reporting Thyroid Cytopathology (BSRTC)” was designed. Objective: The objective of this study was to review the Bethesda thyroid FNA classification system in evaluation of thyroid nodules. Materials and Methods: This study was conducted over 4½ years. 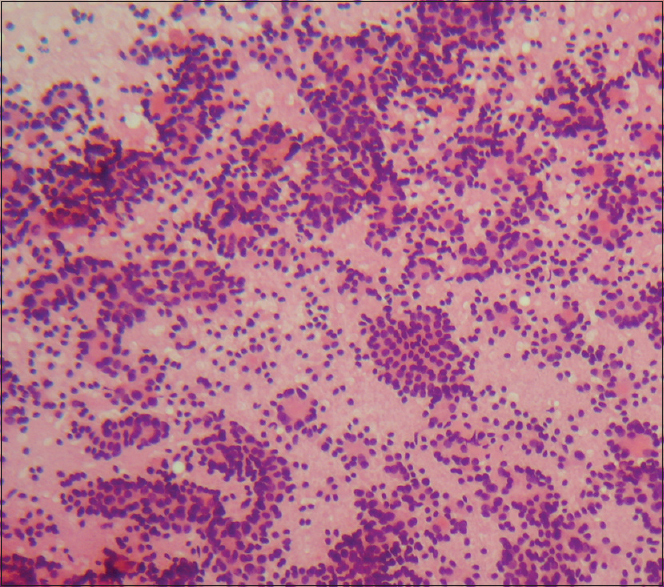 Fine-needle aspiration was done by palpation or ultrasound-guided, using a fine (25 or 27G) needle, and cytological smears were prepared using Giemsa, hematoxylin and eosin, and Papanicolaou stain. These smears were then examined and classified according to the BSRTC. Results: Of the 504 cases analyzed, benign lesions were the most common (78.9%), followed by malignant (4.2%), suspicious for follicular neoplasm/follicular neoplasm (4.2%), atypia/follicular lesion of undetermined significance (3.9%), and suspicious for malignancy (3.6%). Good cytohistological correlation (94.4%) was observed. Only 5.2% smears were nondiagnostic. Limitations: Small sample size for which histopathological follow-up was available. Conclusions: The BSRTC is a systematized 6-tier classification system for thyroid nodule aspirates. It is based on a complete literature analysis and is a unified risk-based reporting system. Background: Levothyroxine sodium is widely prescribed to treat primary hypothyroidism. Conventionally, levothyroxine is asked to be taken in the morning on an empty stomach. A pilot study showed that levothyroxine intake at bedtime significantly decreased thyrotropin levels and increased free thyroxine (fT) and total triiodothyronine levels. Till date, no large randomized trial investigating the best time of levothyroxine intake, including quality-of-life evaluation has been performed. Materials and Methods: The primary objective of this study was to compare the serum thyroid stimulating hormone and fT4level between patients taking evening dose of levothyroxine with patients taking morning dose. The secondary objectives were to compare lipid profile between patients of the two groups. Results: A total of 147 patients were recruited and randomized into either of the study groups (73 in Group A and 72 in Group B). A total of 58 patients in Group A and 57 patients in Group B were considered for statistical evaluation. There was no statistical difference in achievement of euthyroidism and improvement of thyroid profile between the two groups. Changes in values of total cholesterol, triglyceride, low-density lipoprotein (LDL), very LDL and high-density lipoprotein were not significantly different between the groups. Conclusions: Levothyroxine taken at bedtime improved thyroid hormone level. Serum lipid levels showed no significant changes with bedtime versus morning intake. Clinicians may consider prescribing levothyroxine at bedtime as an alternative to the conventional morning dose. Long-standing hypothyroidism causing thyrotroph hyperplasia can result in enlargement of the pituitary gland and hyperprolactinemia. A 20-year-old unmarried girl presented with galactorrhea for 4 months. She was evaluated and diagnosed to have severe hypothyroidism resulting in hyperprolactinemia and reversible pituitary hyperplasia. 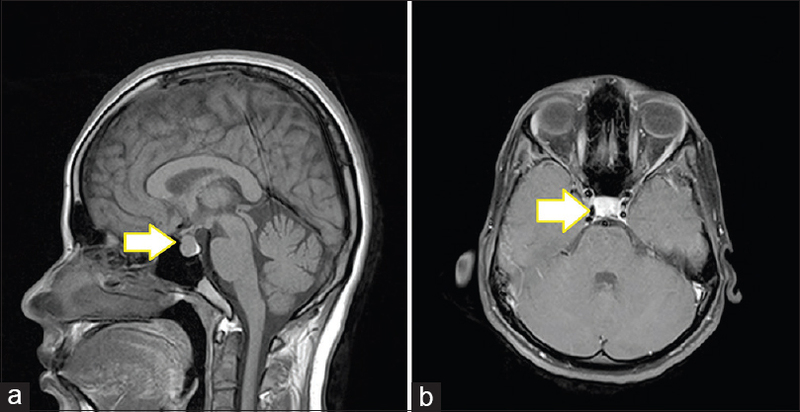 This case helps the clinicians to be aware of an unusual presentation of severe primary hypothyroidism and reminds to consider it in the differential diagnosis of pituitary enlargement with mild hyperprolactinemia. Graves' disease (GD) in pregnancy is common, and management is often challenging during pregnancy and postpartum. Antithyroid drugs (ATDs) cross the placenta and inhibit fetal thyroid hormone production, whereas anti-thyrotropin receptor antibody (TRAb) cross the placenta and stimulate thyroid hormone production and last longer than ATDs in neonate's circulation (3–12 weeks vs. 7–10 days). The resultant clinical presentation, therefore, depends on the age of the child and the balance between the opposing effect of ATD and TRAb. We present a case of an infant born to a mother with active GD, on ATD treatment who presented with diagnostic and therapeutic dilemma. We performed masterly inactivity as his thyrotropin levels sequentially changed from elevated at birth to suppressed at 1 month age to stable after 3 months onward. Knowledge of natural history and pathogenesis of alteration of thyroid function test in an infant born to mothers of GD on carbimazole are essential for appropriate management.